Santrovélo is a do-it-yourself community bike shop associated with and supported by Santropol Roulant. Our mission is to empower community members and promote active transportation, cycling safety and eco-sustainability through bike repair. Our volunteer mechanics provide knowledge and access to tools in an enthusiastic, respectful and inclusive safe-space. SantroVélo is a place of learning, so we won’t fix your bike for you like at a regular bike shop. Instead, the volunteers will teach, guide and support you as you learn to fix your bike and use the tools yourself. 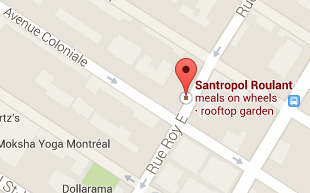 The entrance to our workshop is located in Santropol Roulant’s alley. Come and visit us! Generous volunteers run the workshop, so these hours may change depending on their availabilities. To keep up to date on opening hours, check out the Santrovélo Facebook Page. Per visit Perfect for once or twice a year. Per Year Become a member! Santrovélo has both used and new bike parts for sale to help you put your bike in good working order. New parts are usually sold at the suggested retail price, while used parts are sold on a sliding scale depending both on the quality of the part and the person’s capacity to pay. Note that for the shop use fee and for used parts, no one will be turned away due to lack of funds. Above video: Santrovelo – Atelier de réparation de vélo communautaire à Montréal by Arnaud. Volunteer mechanics will teach, guide and support you as you learn to fix your bike and use the tools yourself. You’ll see, it’s really not hard, and you’ll learn a lot about your bike. Plus, you’ll save a lot of money and you’ll be proud of your bike! 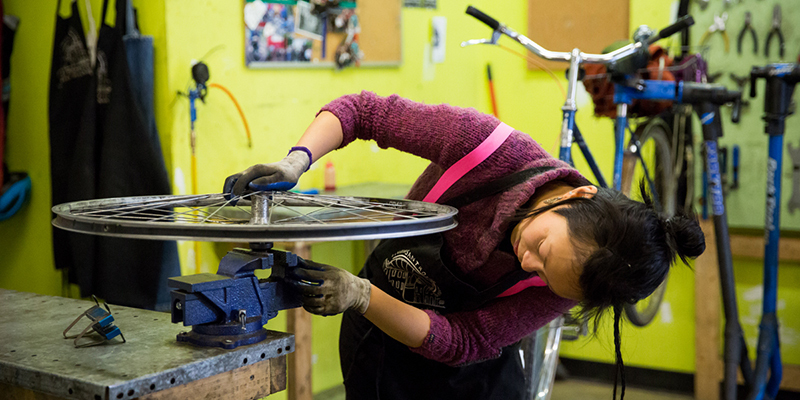 Our volunteers are helpful and friendly, and they care a lot about making the bike shop feel welcoming to everyone. Got a bike sitting in your garage or on your balcony that you don’t know what to do with? Why not donate it to a good cause! Santrovélo is always looking for used bikes that can be stripped for parts, fixed up for sale, or put in working order to be used by our meals on wheels, agriculture and fruit harvesting teams. Contact us by email by email or at 514-284-9335 for more information about whether we can take your bike and when to drop it off. Keep in mind that we aren’t the only community bike shop in Montreal. See this map to find other shops that are similar to ours.